From its conception, this special edition has had a simple goal: to help SAP customers better understand SAP HANA and determine how they can best leverage this transformative technology in their organization. Accordingly, we reached out to a variety of experts and authorities across the SAP ecosystem to provide a true 360-degree perspective on SAP HANA. 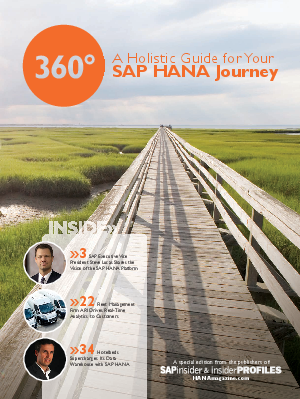 For example, bookending this magazine’s contents are insights from two SAP executives who live and breathe SAP HANA: Steve Lucas off ers an overview of the SAP HANA journey to date, and Irfan Khan closes with a sneak peek at the future vision for the product.